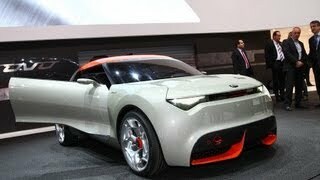 South Korean based automaker Kia has unveiled the new Provo Concept at the 2013 Geneva Motor Show. 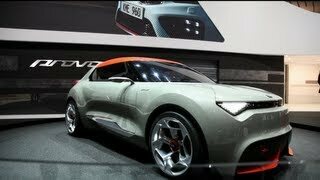 The Provo Concept is a coupe-style hatchback with a hybrid powertrain, which mixes ultra-modern technology with a self-confident and agile look. This is a car designed for fun – pure and simple. Every curve, crease and line combines to bring Provo to life with a single purpose – to delight and entrance its owner and to bring a smile to the driver's face. On the exterior it gets a aero-style splitter, carbon-fibre panels and tiny LED cluster front lights, visor-look windscreen (also featuring an aerodynamic splitter with an adjustable vent system to direct airflow). 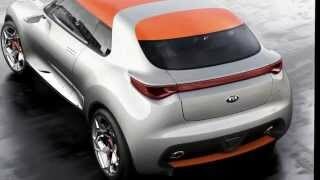 Moving inside, the Kia Europe Design team was able to let imaginations run free although in typical Kia fashion it delivers clear functionality with exuberant style – essential if Provo is to go into production at some point in the future. 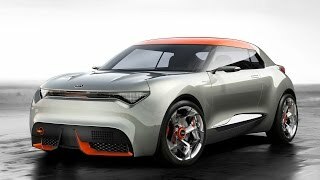 It is powered by the four cylinder turbocharged 1.6-litre GDI (Gasoline Direct Injection) engine. It produces 204 ps with smart-4WD-hybrid technology from an electric motor delivering an additional power surge to the rear wheels when required and also allowing low-speed electric-only motion. A seven-speed DCT transmission – Kia’s first – completes the impressive technical package.